We can all agree that recycling is a great thing. Whether reforming paper, cardboard and plastics, or burying vegans alive to grow new plants, we should all be doing our best to minimise waste. But, have you ever tried to recycle an entire building? Well, that is precisely what the proprietor of the New Road Hotel decided to do, by taking a former textile factory in which he worked over 50 years ago, and converting it into an industrial-chic, boutique hotel. In every regard, the immaculately rejuvenated space is a masterpiece in its own right, but perhaps most exciting of all, is the fact that it now plays host to Mr White’s Chophouse – a new Marco Pierre White restaurant with a full, halal menu. The food is of course, forged in the renowned chef’s signature style – thoroughly English in nature, with a blend of French flair, and the menu is every bit as carnivorous as one would expect. Having accepted an invitation alongside Haloodie Foodie, Halal Hunt, and one of the masterminds behind The Great Chase, we settled in and began our meal with a selection of starters. The Quail Eggs Maintenon instantly stole the limelight, with its soft, oozing quail eggs, umami mushroom duxelles, and rich, buttery hollandaise. The Smoked Mackerel Brandade meanwhile, came as a bit of a surprise. Served cold, the soft mackerel – which was strong in aroma, but not overly pungent, proved to be fairly moreish, though, it may not appeal to everyone’s palate. We also tried a plate of calamari, which naturally, paired well with the accompanying lemon and tartare sauce. Texturally however, the batter was not quite as crispy as I would have liked. After moving on to our main courses, it did not take long to discover a unanimous favourite. 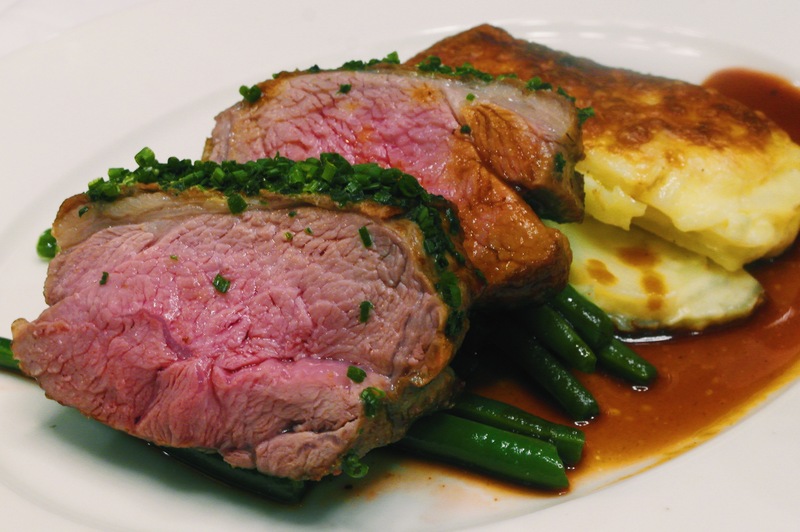 The Roast Rump of Lamb Dijonnaise immediately established itself as the most eloquently executed dish on the table, owing to the set of rich and bold flavours that oozed out of the thick and succulent lamb. This sensory experience was only elevated further by the accompanying dauphinoise potatoes. Perfectly baked, the crisp and rich crust contrasted with the soft and smooth potatoes, and the entire structure did well to soak up the rich rosemary jus. We also tried a 35-day dry-aged T-Bone steak, which arrived with a flawless medium-rare cook. Both segments of the T-Bone were tender and well-seasoned, and the soft fat offered a pleasant, creamy flavour. But, whilst it was a reasonably enjoyable cut, it did not possess a substantial amount of depth or complexity, despite its dry-ageing. As the meat-sweats began to kick in, we tucked into the “mixed grill for two”, comprised of lamb chops, beef fillet, roast chicken breast and grilled jumbo shrimps, served with triple-cooked chips, roast vine tomatoes, and bearnaise sauce. The lamb chops were thick and juicy, and the fat pleasantly rich and gamey, whilst the beef fillet was tender, but relatively tame. Unfortunately, the chicken breast proved to be rather dry, and this was noted and relayed back to the team. Fortunately, the “Roast Chicken A La Forestiere” fared a little better, and the assortment of wild mushrooms and roasting juices delivered a light sharpness that cut through the chicken. For dessert, we began with the sticky toffee pudding, which, in true form, was thick, rich, and piping hot. Texturally, there was room for improvement however, as the accompanying butterscotch sauce was a little “slurry-like” in its consistency, whilst the vanilla ice cream needed a little more thawing. The blueberry cheesecake on the other hand, was simply fantastic. The sharp, refreshing blueberry coulis cut through the thick and heavenly clotted cream, and both elements were unified by the crumbly biscuit base, which simply rounded off a perfect creation. The Eton Mess was equally delightful, with its thick, decadent cream, bright, refreshing strawberries, and sinfully sticky meringue. Generally, starters cost between £8 to £10, mains and steaks range from £15 through to £55, and desserts cost around £7. As a rough estimate, an average meal for two would probably cost anywhere between £50 to £70 (£25 to £35 a head), and as such, a meal here would perhaps be a lot steeper than a regular restaurant-goer in Whitechapel would be accustomed to. Alas, it must be remembered that with the Marco Pierre White name, comes the Marco Pierre White premium, and whilst certain dishes need a little enhancement, the quality and calibre of the food is still rather good. Indeed, in my eyes, a £22.50 fee for that divine plate of roast lamb rump would be worth every penny. Given the overt nature of our visit, it would not be possible to comment on the quality of the service as of yet, but from our perspective, staff members seemed to be incredibly welcoming and courteous, and although the newly-employed waiting staff are likely still finding their feet, service seemed to run smoothly for fellow patrons throughout the night. Without a doubt, the most alluring aspect of Mr White’s Chophouse – or rather, of New Road Hotel, is the truly admirable decor. Each and every detail of the layout and design has been painstakingly considered, and much to the delight of my elderly soul, many aspects of the original textile factory have been retained. It is without a doubt, a seamless blend of history, heritage, and contemporary hospitality, and the ambience is truly serene. The hotel and restaurant can be found a short walk away from Whitechapel station, and parking is available outside of restricted hours on nearby residential roads. With its classic, meat-based Anglo-French menu, and its endearing setting within New Road Hotel, Mr White’s English Chophouse is a welcome addition to the East End’s food scene. Both the restaurant and the hotel exude potential and ambition, and with very few teething issues for a restaurant that has been open for just two weeks, I am hopeful that the culinary experience will only get better. I for one, will definitely be returning, and if you’ve had enough of the usual assortment of Whitechapel eateries, I’d certainly advise paying them a visit. Halal status: All the meats are certified halal. Alcohol is served on the premises via a cocktail bar located adjacent to the restaurant. Disclaimer: We were invited to sample the menu at Mr White’s Chophouse.